Coming next week: Junior and Senior Concert Bands perform at the CCEAM Conference on June 9, 5:00 p.m., at Tilley Hall on the UNB campus! Senior Concert Band upcoming combined concert @ FHS on May.29th at 7:30pm. $5 per person and $12 per family. George Street Middle School Presents: Alice in Wonderland: The Musical! 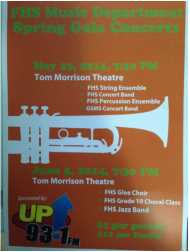 GSMS/FHS Spring Concert: Sunday, March 30 2014 at 2:30 p.m. Tickets available at Fredericton High School. Come check out our Senior Concert Band and Jazz Band students as they perform in a concert with Fredericton High School's bands. You won't want to miss this show! Stay tuned for upcoming performance dates for Beginner Band, Concert Band, Jazz Band and Glee! In the meantime, check out the GSMS Jazz Band playing with TJ Wheeler at the Harvest Jazz and Blues Festival 2012!